Malloy is a faithless American priest clerking at the Vatican in the late 1960s. At night he drives to his apartment where his mistress, Franca, waits for him. Meanwhile, a group of cardinals who oppose the current pope are conspiring to assassinate him. Two men are hired to carry out the assassination in front of a huge Easter audience. But when Franca becomes involved with the conspirators, and a man is killed, Malloy trades his fatalism for outrage to become the savior he does not believe in. Hammill’s debut novel is steeped in noir sensibility: bleak, sexual and cynical. The disillusionment in each character questions the motives of every social entity including, most crucially, the Church. This is a tense, page-turning thriller that is as pertinent today as it was when it was first published. "Hamill is better known as one of our greatest chroniclers of New York City. In this, his first novel, rereleased on its 50th anniversary, he goes all hard-boiled noir, telling the story of a disaffected American priest and a plot to kill the pope." "I'm a big fan of Pete Hamill's, and can't think of a finer New York novel than Forever. Somehow I'd missed his first book, A Killing for Christ, and am grateful to Akashic for having brought out this fiftieth anniversary edition. It's a strong tale well told, with compelling and fully realized characters. Hamill has grown as a writer since 1968--it would be remarkable if he had not--but you can glimpse in this first novel the writer he would become." "This reissue marks the 50th anniversary of the publication of journalist Hamill's first novel...In a new introduction, Hamill comments on the book's influences and what he now considers its primary theme: the loss of faith." "A Killing for Christ is steeped in noir sensibility....This is a tense, page-turning thriller that is as pertinent today as it was when it was first published." "A Killing for Christ has a secret agent out of John le Carr and a spoiled priest-her out of Graham Greene, and Pete Hamill created a novel of suspense that is all his own, and that is why he is a Brooklyn treasure." "As a portrait of time and place, A Killing for Christ is perfect...A Killing for Christ is a gem of a literary thriller, alive with the best noir qualities and not at all date. The Akashic 50th anniversary edition should bring a great novel to the attention of a new audience." 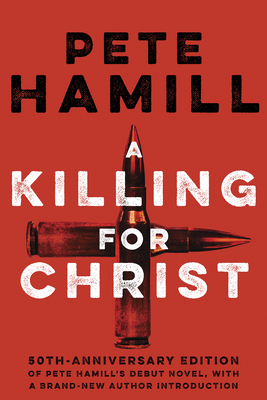 "A Killing for Christ is a fast-paced, topical thriller...Hamill's prose is stylishly punchy...I would guess that Hamill admires Hemingway, Jimmy Breslin, and Mickey Spillane--not always in that order." "The Helen Macinnes touch...the Hitchcock air." "The style and substance of this first novel owes much to hardboiled, gutsy, private-eye fiction and to a general submersion into obscenity and violence." A secret agent out of John le Carr ...a spoiled priest-hero out of Graham Greene...a high-voltage novel of suspense that is Pete Hamill's own. The man in priest's garb gets out of the elevator at the top floor, leaving the gate ajar. He removes the rifle from under his habit and opens the breech. It's loaded. He closes it and steps to the edge of the roof. St. Peter's Square is spread out before him like a great, colorful lake. There are more people than he has ever seen before. Pete Hamill was born in Brooklyn in 1935 and is, for many, the living embodiment of New York City. In his writing for the New York Daily News, the New York Post, and New York magazine, he has brought the city to life for millions of readers. He is the author of many best-selling books, including the novels Forever and Snow in August, as well the memoir A Drinking Life. He recently moved back to Brooklyn.